Reservoir models are living digital twins of subsurface geological formations and their hydrocarbon content. Over time new data is acquired and new technologies improve the imaging and simulation of the present and future of the reservoir. Different groups of professionals work at enriching the model. 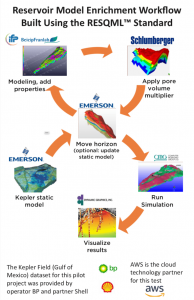 A number of software platforms provide the necessary tools to perform some or most of the steps from geological model to flow simulation and visualization. In most cases a team working on an asset will be using software from different vendors to leverage specific technologies best aligned with the particularities of the reservoir. Using different software platforms entails outputting digital files from one platform and reading them into another one. Before data exchange standards were available, each such a data transfer entailed developing and maintaining data transfer pairs between different platforms, which could result in tens of data utilities requiring support and maintenance. The RESQML data exchange format has been many years in the works, under the steerage of its Special Interest Group (SIG) consisting of specialists from operator, service, software companies as well as academic and governmental institutions. It has now reached maturity with the 2.01 version from 2017. With such a standard, each software platform only needs to have one input and one output utility to and from the standard exchange format. The SIG decided to put together a full size pilot project to demonstrate the maturity of the standard and showcase the powerful ability to enrich a reservoir model by using a very diverse suite of software platforms and tools. It must be stated that each of the participating software tools has a much broader set of capabilities than are used in the pilot project. A real Gulf of Mexico dataset was contributed by consortium members BP (Operator) and Shell (Partner). The dataset is from the Kepler field, part of the Na-Kika complex offshore Louisiana – see photo. At SEG2018 in Anaheim, the pilot project was demonstrated twice at the HPC theatre. For presentation purposes the software was installed and operated in the Amazon Web Services (AWS) cloud. The step involving Petrel* required moving the data from AWS to DELFI hosted on Google Cloud Platform and back, adding a multi-cloud component to the workflow. For operators and for service companies performing integrated reservoir studies, data exchange standards make it much easier and cost-effective to build workflows involving multiple software platforms, while reducing the workload of data management support staff in overseeing the data exchange process. This increased flexibility and efficiency frees up more time and resources to enrich the reservoir model. For software companies, the adoption by the industry of data exchange standards alleviates the burden of developing and maintaining links to numerous other platforms. The investments can be focused on new technologies and increased application efficiencies that are of more value to their customers. Are you a member of Energistics? This pilot project is one of the many benefits of membership of the Energistics consortium. The companies that took part in the pilot project and their SIG colleagues who were involved along the way have gained invaluable insights into the path forward for reservoir model data exchange. We invite all companies: operators, service groups and software development companies to join the SIG or SIGs most relevant to their activity to take part in further improving the standards. Please get in touch with us to discuss membership. Look at the list of companies currently supporting the consortium, read some papers about standards, see our latest news or consider meeting with us at an upcoming event.